MONTHLY SUMMER RENTAL in South Yarmouth! 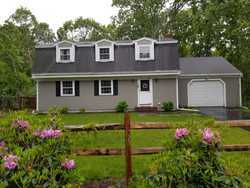 4 Bedroom, 3 bath fully furnished Gambrel Cape house. Sunny kitchen, dining room, living room & family room leading to the backyard deck. Full bath with washer & dryer located on the first level. The bedrooms and 2 additional baths are located on the 2nd level. There is also a one car attached garage to park your car or to store your vacation equipment as well as storage space in the basement. Excellent central location close to Route 6, shopping, restaurants, North & South side beaches and golf courses! No Smoking. Pets considered. Available August. Rental rate is $3000.00 per month with $1000.00 security deposit. For more information please contact Chris Kelly at Shoreland Realty Group 508-771-2008 or email at ckelly@shorelandrealty.com. This home may no longer be available for rent.